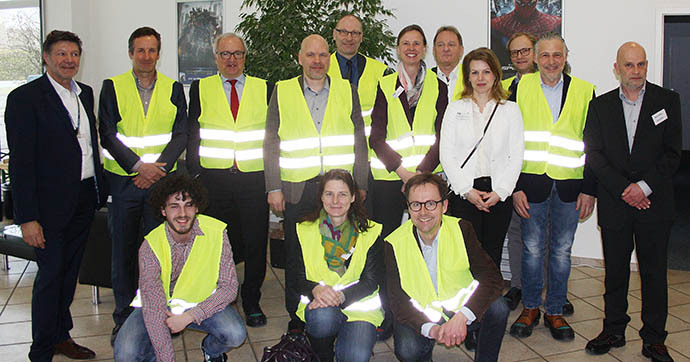 On March 8th 2018, Sony DADC in Germany hosted the meeting of the local Cross Innovation Network and granted the participants an exciting insight into our Distribution Centre in Heusenstamm. Our colleagues Axel Köhler and Michael Schweinsberg highlighted our role as a leading provider of physical distribution solutions to the entertainment industry and beyond. Topic of the subsequent key note speech by Dr. Thomas Lapp, who is specialized in information technology law, was the European Data Protection Directive. His speech started a very lively discussion and provided everyone with the opportunity to have all rising questions answered. The Cross Innovation Network provides a platform for cross-industry exchange and targets at better networking of the local industry. It focuses on the requirements of the industry and therefore the participants themselves define the topics of the regular meetings and discussions. Our guests from the Cross Innovation Network were very impressed by the highly flexible distribution solutions Sony DADC is offering as well as the opportunity to have them individually adapted to the requirements of the respective industry and business. Being a member of the Cross Innovation Network gives us exciting cross-industrial insights and also challenges us in keeping a leading role in delivering best practice solutions. Thanks to our colleagues for organizing and hosting the Cross Innovation Network meeting.